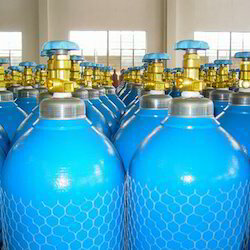 We supply good quality Oxygen Gas which is widely used for various industrial purposes. It is universally accepted as life sustaining solution and an oxidizing agent. It is extremely safe and is used in metal industry and for various applications. In addition to that, it is considered a highly beneficial agent in the health sector. It is easy to carry in compressed gas cylinders. We supply quality Oxygen Gas which is highly demanded by our valuable clients. It is considered as an strong oxidizing agent and comprises of several life-sustaining properties. It is used for manufacturing medicine for therapeutic purposes and manufacturing steel and metal-cutting applications. It is easily carried in compressed gas cylinders. It is highly safe and is used in various industries such as pharmaceuticals, glass, ceramics, paper, chemical and in the health sector.